A gorgeous display of different colour throughout the year. The palm-shaped leaves are sharply-toothed and emerge bright-red when young, maturing to a fresh yellow-green before turning orange and red in the autumn - making a colourful kaleidoscope of colour in the garden. 'Moonrise' is ideally suited as a focal point in your garden and is especially useful to illuminate a partially shaded border. 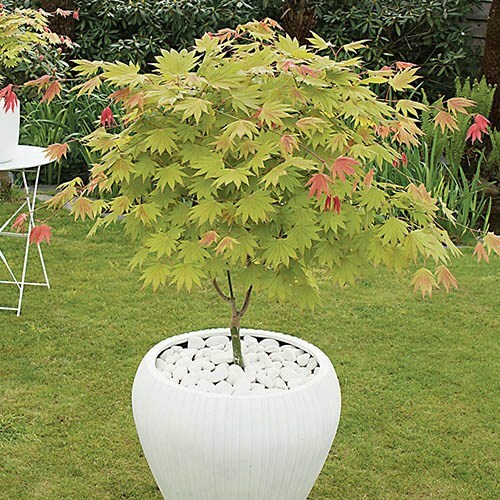 Said to be more resistant to leaf scorch than other acers, we do recommend that you provide some shelter so that you can enjoy the striking foliage at its best. Please note that the decorative pot shown in the images is not supplied. Leaf colour is best in partial shade, although full sun can be tolerated. Leaf scorch can be caused by lack of soil moisture or excessive exposure to wind.